300+ Handcrafted Sessions to Help You Scale. No fluff. No commercials. No boring panels. 500+ 1-on-1 and small group meetings. 40+ AMAs with top industry VPs who've done it. 50+ VC Day sessions. Buddy Matching. Just you, us, and your new SaaS BFFs. And don't miss The Big Party! "I'm Bringing Fill-in-the-Blank Termsheets to SaaStr Annual To Handle All The Awesomeness!" Specific, SaaStr-style actionable advice and learnings to help grow your business from $0 to $100M ARR. No commercials, no paid content, no boring panels. Every session is hand-screened and vetted to help you learn. SaaStr is all about our community. We provide endless opportunities to share and learn with peers from every role, function, industry, company size, and beyond. You have never experienced an event quite like this. It's all here to help you, and your team, scale. 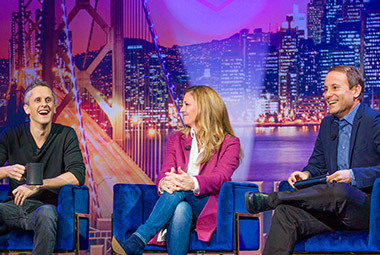 If you are a B2B founder, exec or investor, SaaStr 2019 is a must-attend event!! "SaaStr is the one place for all SaaS groupies to get together and meet each other in person."